Geographers are commonly called upon to diagnose the causes of natural disasters and provide guidance for policy makers. This case study concerns one of the landslide and flood disasters that afflicted the Himalaya in the later Monsoon of 2010, the Almora District (Uttarakhand), landslide swarm, which affected thousands of kilometres of roadway and caused damages >$ 125,000,000. Causes were sought on a 7.4km reach of roadway that had been part of a previous study. Individual landslides were surveyed along with a suite of potential environmental indicators. These results show that the numbers of landslides on the roadbed were not unusual, so research switched to exploring factors that may have enhanced their volumes. Local opinion considers that the major causes were human impacts, especially recent urban development, or geological weaknesses. However, results show that human impacts such as building construction, deforestation, and the collapse of agricultural terraces were associated with smaller landslides, while geological factors showed no significant correlations with landslide volume. Road engineering factors such as the location of another road upslope and the collapse of roadcut retaining wall also proved unimportant. However, the height of the roadcut, channel incision undermining the roadcut and, especially, the steepness of the hillside upslope proved significant. Despite the absence of any direct link between human activity and landslide volumes in Almora, a comparison of the 2010 results from this survey and that of another reach of hill road, which was also part of the 1985 survey, showed important differences in landslide numbers. In 1985, the Kilbury Road, which cuts through reserved forest, carried 153 landslides to the Almora Lower Mall’s 88. In 2010, there were only 9 landslides on the Kilbury Road but 108 on the suburban Almora Lower Mall. The conclusion is that human impacts in Almora have combined to prevent the landslides healing as they have in the undisturbed forest along the Kilbury Road. However, past surveys confirm that landslide numbers on the Almora Lower Mall have remained steady since 1985. Since, the impacts of this rainfall event were manifest only as increased landslide outfall, not increased numbers, the chief influences of outfall volume remain hillslope angle, height of the initial roadcut, undermining by channel incision and the fact that these hillsides exist close to criticality, their limits of stability. Les géographes se voient régulièrement sollicités pour diagnostiquer les causes des catastrophes naturelles et fournir des pistes aux décideurs politiques. Notre étude porte sur un des cataclysmes - glissements de terrain et inondations - ayant touché le district himalayen d’Almora (Uttarakhand), durant la fin de la mousson de 2010. Le phénomène a affecté des milliers de kilomètres de routes et ses ravages se sont chiffrés à plus de 125 000 000 $. Les causes ont été investiguées sur une portion de route de 7,4 km qui avait fait l’objet d’une étude antérieure. Les glissements de terrain ont été examinés un par un, avec identification d’une série d’indicateurs environnementaux rendant compte de causes possibles. Les résultats ont montré que le nombre de glissements enregistrés sur la route n’était pas inhabituel. L’étude se porta dès lors sur l’exploration des facteurs susceptibles d’avoir accru leur volume. L’opinion locale y voyait principalement des impacts humains, en particulier le développement urbain récent, ou encore certaines faiblesses géologiques. Cependant, les résultats prouvent que les impacts humains tels que la construction, la déforestation et l’effondrement des terrasses agricoles étaient associés à des glissements de moindre ampleur, tandis que les facteurs géologiques ne montraient pas de corrélations significatives avec le volume des glissements. Les facteurs de génie routier comme la présence d’une autre route en amont de la pente et l’effondrement d’un mur de soutènement se révélèrent tout aussi peu concluants. A contrario, la hauteur du déblai, l’incision de la route et, tout particulièrement, la raideur de la pente de la colline ont bel et bien joué un rôle déterminant. En dépit de l’absence de lien direct entre activité humaine et volume des glissements à Almora, une comparaison des résultats de 2010 avec ceux obtenus sur une autre portion de route qui faisait également l’objet de l’étude de 1985 ont montré des différences importantes quant au nombre de glissements. En 1985, la Kilbury Road, qui traverse une réserve forestière, avait enregistré 153 glissements, pour 88 sur le Lower Mall d’Almora. En 2010, on ne constata que 9 glissements sur la Kilbury Road contre 108 sur le Lower Mall en périphérie d’Almora. En conclusion, les impacts humains combinés à Almora ont empêché la stabilisation des glissements, comme dans le cas de la forêt intacte le long de la Kilbury Road. Toutefois, des études précédentes confirment que le nombre de glissements sur le Lower Mall d’Almora est demeuré stable depuis 1985. En conséquence, les impacts de ces précipitations exceptionnelles se sont traduits seulement par une augmentation du volume des glissements, pas de leur nombre. Les causes principales qui expliquent le volume des glissements demeurent l’angle de la pente, la hauteur du déblai initial, la sape par incision de la route et le fait que ces pentes incisées sont proches de leur limite critique de stabilité. 1Scenes of landslide and flood disasters are regular features in the news media ; they flicker across the screen and are quickly forgotten. Even in the affected locale, once the debris is tidied up and damaged infrastructure repaired, attention moves on and all that remains is a half-life of litigation, official reports, and occasional mitigation engineering. Frequently, geographers are called upon to assist in such aftermath investigations and to make recommendations for policy makers (Kapur, 2010). This paper reflects upon one such situation and upon the results of an investigation into its causes and, specifically, to explain why a disaster affected this location and not some other. This study is also a cautionary tale because, by chance, it happens to show how scientifically conducted and statistically validated research on a single disaster event can generate findings that become far less secure when viewed from a longer term perspective. 2This case study concerns one of the landslide and flooding disasters that affected the Himalayan region in 2010, specifically, the consequences of the rainfall event of 18th/19th September, 2010, in Almora District of the Kumaun Lesser Himalaya, Uttarakhand, India, which had a severity unprecedented in 60 years of record (Figure 1). Here, a late Monsoon downpour deposited 277 mm of rainfall in just 48 hours at intensities that peaked at 33 mm/hr (District Administration, Almora, 2011). Falling on land that was already saturated, not least because of heavy rains on the previous two days, the result was a swarm of landslides and debris flows, and a spate of surface water runoff and mobilised debris that swept, downslope, into the river network, creating a major flood surge in the region’s main drainage channel, the River Kosi (Kaushilya Ganga). River discharge rose from its pre-Monsoon level of 0.07m³/sec (20th June 2010) to a peak of 618.1 m³/sec (18th September, 2010). The flood surge caused severe bank erosion and, where it swept against the steep Himalayan hillsides, caused toe erosion that triggered further landslides. 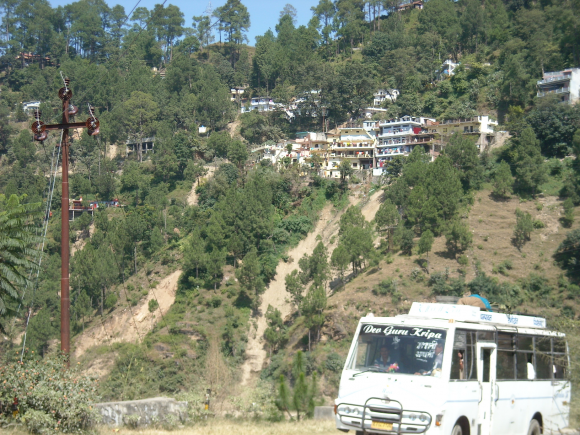 Inevitably, Almora’s infrastructure, especially its road network, was badly disrupted. People were killed when their homes became engulfed in landslide debris and hundreds of trucks were trapped on roads that were, variously, blocked by landslides, undercut by landslides or washed out by river erosion (Sati et al., 2011). A month after the disaster, much of the network remained impassable (Rawat, 2010a). Figure 1. 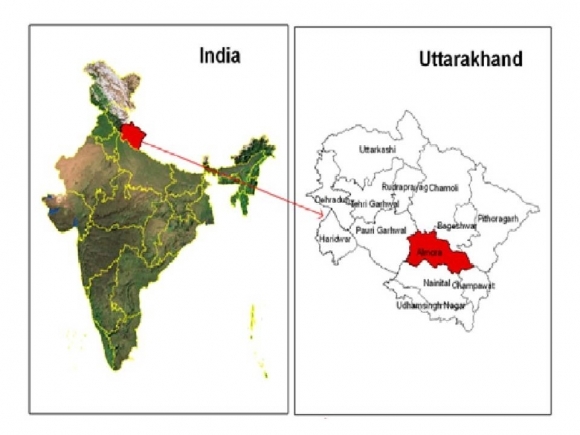 Location of Almora District, Uttarakhand, India. 3Disasters of this kind are far from unusual (SAARC Secretariat, 1992). However, as always, in the aftermath, the affected communities asked two questions. The first : how much damage has been done and how much will it cost to rebuild? The second : who or what is to blame for the problem and what can be done to mitigate future problems. The task of finding answers fell to the Physical Geographers at the local, Almora branch, of Kumaun University, and its academic-exchange visitor (Rawat, 2010ab). 4GIS-based data collation made collating answers to the first question relatively easy. The disaster had affected around 80 % of the district’s people and the total damages exceeded US$ 125 million. The full results are summarised as Table 1. Table 1. Disaster damage inventory for Almora District, September 2010. 5However, finding answers to the second question proved much more difficult and it is this less tractable problem that this paper addresses. Here, fortunately, some resources existed to make this research much easier. In 1985, the authors had conducted a detailed field survey of landslides along two 7.4 km reaches of new Kumauni hill road. One of these was the Almora Bypass, the Lower Mall Road, located in the centre of the 2010 disaster area on the suburbanising outskirts of Almora town (29o35-37’N 79o38-39’E ; elevation 1500 m, on the upper convexity of the generally north-west facing slope of the Kosi Valley, Figure 2), and the other, the Kilbury Road, which was located in dense reserved forest near Nainital, 64 km distant, and outside the disaster zone (29o24-25’N 79o27-26E ; elevation 2250 m, north-east facing slope) (Haigh et al., 1988a). Figure 2. Almora Lower Mall : Suburban fringe. 6These studies were based on direct field measurement using simple instruments : abney level, compass, clinometer, and tape measure. Each landslide large enough to be a major traffic hazard, that is large enough to deposit >1.0 cubic metres of debris on the roadbed, was measured in the field (Figure 3). This new survey was undertaken within 3 weeks of the catastrophic events of September 18th, 2010, and with the help of an energetic team (including : Umashankar Negi, Gokhul Singh Rana, Arbind Anand, Pradeep Tiwari and Vikrant, all of Kumaun University), two of whom have formal mountain climbing training. As a consequence, the 2010 survey was more accurate because it was less restricted to the roadbed than preceding surveys of the same reach of roadway (Haigh et al., 1993). Each major landslide was scaled - at least as far as the top of its debris cone and typically to the top of its scar, which means that records of scar and outfall dimensions are quite precise (Figure 4). Figure 3. Landslide debris on the Almora Lower Mall. Figure 4. Field survey of landslides : Almora Lower Mall, 2010. Originally, in 1985, two types of survey were conducted (Haigh et al., 1988a). The first examined average environmental conditions at each 200 m Public Works Department milepost. These data, samples of 37 records on each roadway, are summarised as Table 2. Table 2. Comparison of environmental characteristics of the Kilbury Road, Nainital and Almora Lower Mall Road, Uttarakhand, Lesser Himalaya. 7The second survey, repeated in 2010, recorded a suite of environmental variables at every landslide. These included local slope orientation, angle upslope and down-slope of the road, rock-type, geological dip, and the number of joints and fractures per metre, ground cover by ground vegetation and by tree canopy above the roadbed, road width, the angle and height of the road-cut and the depth of soil and any other loose debris there exposed. Also recorded were the type of landslide (rockfall, slump/rotational slip, or debris flow) and their dimensions : width, depth and inclination (Haigh, 1984 ; cf. Crozier, 1973). The original aim was to explore the environmental correlates of landslide activity. However, in the aftermath of September 2010, both the media and local opinion sought explanations that linked landslide occurrence to human activities and development. These included the construction of buildings, the effects of other roadways upslope of the roadcut, and the collapse of abandoned agricultural terraces (Rautelaa and Paulb, 2001). These factors were recorded as present/absent variables at each landslide site. The project also recorded engineering attempts to prevent landslides, mainly the construction of retaining walls, which, of course, also provides recognition of potential instability at the site. 8As previously, statistical analysis is used to evaluate the influence of different factors on landslide activity. Correlation is used to determine associations between variables, T-testing to establish differences between categories, and discriminant analysis to effect classification (cf. Haigh, 1984, Haigh et al., 1993). The correlation analysis is based on the calculation of Spearman’s Correlation coefficient (a nonparametric measure that produces results similar to those of Pearson but that does not assume data normality). The test employed is one-tailed for the reason that theory predicts whether or not an association with landslide volume should be positive, as in the case of all human impacts, or negative as in the case of mitigating factors such as vegetation cover, rock strength, or the construction of retaining walls. T-tests are used to contrast landslide attributes both at sites where a particular variable is present or absent and to contrast sites where the test variable score is above its upper third percentile and that where it is below its lower third. Discriminant analysis is a technique that seeks to determine (by a stepwise process of adding and removing variables) if the differences between two or categories in a data are significant by calculating that weighted combination of variables that best differentiates between the two populations. It then uses the resulting discriminant function to reclassify data back into the two originally defined sets and its efficiency at this task is recorded (Klecka, 1967). Here, discriminant analyses are used for data screening purposes, in an attempt to link variables associated with key landslide conditions. 9All of the statistical analyses are constructed formally, case by case, on a suite of null hypotheses. In the correlation tests, these null hypotheses argue that there is no significant association between landslide volume and any particular variable. In the T-tests, the null hypotheses argue that there is no significant difference between landslides at sites where the test-variable is present and where it is absent or where it is strongly or weakly developed. In the Discriminant Analyses, the argument is that it is not possible to effect a statistically significant differentiation between the two categories using any combination of the recorded variables. A detailed description of the application of these formal statistical procedures is published in Haigh et al., (1993). 10Table 3 sets the 2010 data from the two sites side by side. T-testing shows that the two data sets differ significantly (p<0.01) in volume of debris and area. Despite the Kilbury Road’s environment being more severe, it produced a relatively small number of smaller landslides, which emerged from steeper slopes with far greater vegetation, soil and subsoil and with a greater association with the reactivation of former landslides. Despite many significant differences between the two sites, the greatest difference is the fact that the Kilbury Road runs through relatively undisturbed reserved forest while the Almora Lower Mall is a busy and rapidly developing suburban highway. Table 3. Comparing the landslide geoecology of the Kilbury Road, Nainital and the Lower Mall Road, Almora, Uttarakhand, India. 11Focussing on the Almora Lower Mall Road, the geography of the 2010 landslides is mapped as Figure 5. 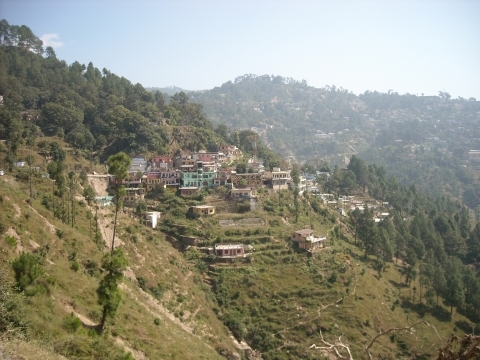 At the time of the disaster, the main assumption in Almora was that the major causal factor was recent change in the urban landscape, human action outweighing any of the geological factors that are usually cited in the causal arguments of academic commentators (Sah and Pande, 1987 ; Pande et al., 2002, Rawat, 2010ab). Figure 5 suggests, immediately, that there is little direct association between landslide incidence and suburban land use. The main landslide clusters are outside the suburban area. Table 4 charts the micro-geographies of 2010 landslide debris volumes along this roadway. An association is suggested between high volumes of debris, high roadcuts, steep hillsides and, to a lesser extent, more forest - even in this aggregated data. Figure 5. Landslides and land use, Almora Lower Mall, 2010. 12However, the first major finding of this study is that the number of landslides falling on the Almora Lower Mall in 2010 was not unusual. This 2010 survey recorded 108 landslides, compared to 112 in 2000, 108 in 1995, 106 in 1990 and 88 in the original survey of 1985 (Haigh et al., 1993). Of course, the volume of debris generated was unusually large in 2010, so the appropriate research question is did human activities help make the landslides larger than they might otherwise have been? If they did, then there should be an association between landslide volumes and human development activities along the road. Formally restated, the multiple working null hypotheses for statistical correlation are that there is no significant association between landslide volume and either any aspect of human development work or any aspect of the geological and geomorphological environment. The statistically significant results of these tests are displayed as Table 4. Table 4. Landslides per km : Almora Lower Mall (from 0.2km east of Pandekhola south to 0.2 km northwest of Karbala (*n.b. These are from a spur-end site beneath a playing field). 13The results show that, while there is a very strong association between the size of the landslide scar and the volume of debris produced (rho : 0.864 ; p<0.0005), this relationship is not perfect since many landslide scars remain active for many years. Here, predictably enough for a rainfall disaster, there is a strong association between landslide volumes and landslide types that involved slumping and flow (p< 0.0005) as well as with associated undercutting by ephemeral streams and debris flow channels (p=0.006). However, the height of the roadcut, another measure of slope weakening by undermining, correlates only with the size of the outfall cone and not the landslide scar (p=0.008). A negative correlation between the angle of the failure plane and landslide volume also indicates the importance of flow processes since gravitational rockfalls link to steeper failure planes (Haigh et al., 1993). There is also a strong association between both landslide outfall and landslide scar volumes and the steepness of the hillside upslope (p<0.0005). 14However, there are few positive correlations between any of the human impact factor variables and the volume of the landslide outfall. A weak but negative association links debris cone volume and agricultural terrace collapse, which suggests that terrace collapse was associated with smaller outfalls. There are also a weak, positive, correlations between new building construction incidence, and also between reactivated landslides, and larger landslide scars but there is no mutual correlation between these two factors. 15Further analysis explores six key human impact variables : two scalar variables – roadcut height and tree cover upslope (i.e. deforestation) and four key associates of landslide activity, which are scored as present or absent in the 2010 survey. These four are the collapse of a road-cut retaining wall, the effects of vibrations and drainage from another road upslope, new building construction, and the collapse of agricultural terraces. T-testing is used to establish significant differences between landslides in places where a particular influence is detected and those where it is not. In the case of the two scalar variables, the test compares that third of sites where the score of the variable is greatest with that third where it is smallest. Once again, the null hypotheses argue that recorded landslide volumes are not significantly different in either of the so-defined paired data sets. These variables divide into two types : those connected with human-induced environmental changes in the wider environment and those connected with road engineering, which are tackled first. Key significant findings are listed in Table 5. Table 5. Significant correlations between landslide volume and potential causal factors (Spearman’s rho correlation coefficient from a 1-tailed test and statistical significance p<0.01, possible significance : p<0.05). 16Road building has been called a major factor in the rising curve of landslides in Nepal (Petley et al., 2007). It is self-evident that the process of cutting a road into a steep hillside permanently undermines and weakens the slope above and, the greater this undermining, the more likely landslides will develop. In Almora, this initial disturbance is now receding into the past but, possibly, it remains a key impact through accelerating rock weathering, the pressure-release of rock joints, and by making the hillside more vulnerable to other kinds of landslide trigger. T-test comparison between the largest and smallest third of the roadcuts shows that the highest roadcuts are associated with significantly larger landslide scars (156.9 vs 64.3 m3 p=0.032), larger debris outfalls (216.8 vs 73.7 m3, p=0.027), and more reactivated landslides (p= 0.014). Of course, the highest roadcuts are found also on steeper slopes (36.8 vs 26.5 degrees, p=0.008), stronger quartzitic rocks (p<0.0005), with less overburden of loose debris (p=0.002) and more southerly slope aspects (p=0.003). These results support the correlation analysis, which identifies the height of the roadcut as a key human impact on landslide debris production. 17However, such impacts of road construction are often mitigated by the construction of retaining walls designed to reinforce slopes weakened by the creation of the road cut. Of course, this activity is not always successful, especially if the retaining walls are not maintained. Here, collapsed retaining walls were associated with 11/108 landslides. These landslides developed on slopes composed of low strength rocks and loose debris (p=0.003) and with more northerly slope aspects (Haigh et al., 1993). Their sites had lower slope angles (9.6 vs 33.3 degrees, p<0.0005) but fewer trees (8.2 vs 29.6 % cover, p=0.008) and less vegetation (49.0 vs 76 % cover, p=0.015) up­slope of the road. However, the landslides that resulted from retaining wall failures are very small compared to the others on the road (debris volume : 13.7 vs 218.5 m3, scar volume 15.0 vs 133.8 m3, p <0.0005), so retaining wall collapse cannot be a factor in the enhanced landslide volumes of 2010. Table 6. Significant differences between landslide volume at site affected by potential causal factors (T-tests : statistical significance p<0.01, possible significance : p<0.05). 18Roads are networks and, where they meet on a steep hillside, hillslope stability may be reduced by the effects of traffic vibration and/or poor drainage. Such problems affect a sixth, 17/108, of the Almora landslides. However, T-tests show that this impact is associated with smaller landslide outfalls and smaller landslide scars (62.8 vs 225.5 m3 and 63.8 vs 132.6, p=0.040). Landslide sites affected by roadways upslope are also relatively unaffected by other human impacts such as house construction (p>0.0005), retaining wall collapse (p=0.001) and agricultural terrace collapse (p=0.030). The conclusion remains that impacts from other roadways on the hillside do not contribute significantly to the enhancement of landslide volumes (Figure 6). In sum, for the roadway, only roadcut height positively affects the size of landslides. Figure 6. 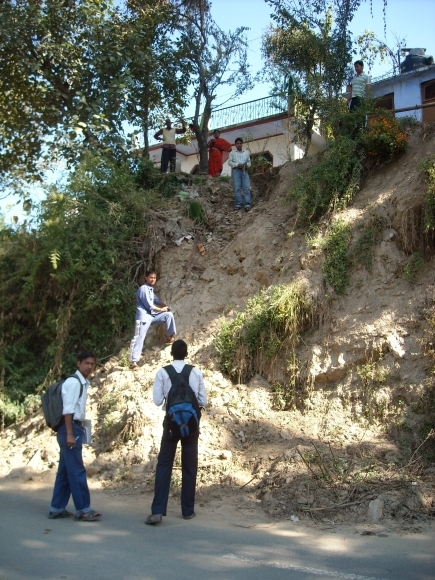 Landslides on the north-eastern part of the Almora Lower Mall. 19Of course, most arguments about the human impact on landslide activity focus on extrinsic issues such as deforestation, which weakens hillsides by removing the root-mat and its connection to bedrock (Froehlich and Starkel, 1993 ; Glade, 2003 ; Crozier, 2005 ; but cf. Haigh et al., 1995), house construction, which interferes with slope drainage, adds extra loading on the slope and often involves further slope undermining, and neglect of the agricultural landscape, which results in the collapse among the flights of agricultural terraces that line these hillsides, especially in areas where there are deeper than usual deposits of soil and regolith. In Uttarakhand, most agricultural terraces are constructed on former landslide deposits, which, although inherently less stable, provide more gentle slopes, deeper substrates and usually more available soil moisture than undisturbed slopes (Bartarya and Valdiya, 1989). 20Deforestation is supposed to encourage landslide activity. However, here, the slopes with the greatest tree cover generate more landslide outfall than those with the least, 303 vs 95 m3, and even if this difference is not statistically significant (p=0.32), the fact remains that the relationship is the inverse of that predicted. The T-tests also show that those landslide sites with the greatest tree cover are found on slopes where the apparent dip of the rocks towards the road is significantly greater (19 vs 6 degrees ; p=0.042), so too the depth of soil (0.28 vs 0.17m ; p<0.0005) but where there is less loose debris above bedrock (1.1 vs 2.7m ; p<0.0005) and less house construction (p<0.0005). As reported previously, these relationships suggest that trees survive, mainly, on slopes that are less stable and, consequently, less suited for development, but inherently more prone to landslide activity (Haigh et al., 1995). This provides a nice circle of causality but the fact remains that these results do not suggest that deforestation positively affects landslide size in this context. 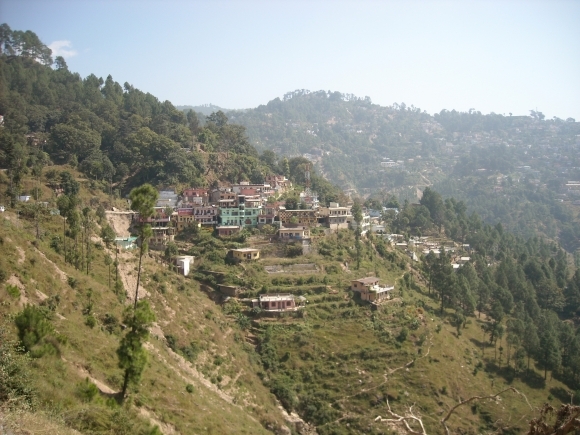 21New buildings on the Almora ridge suffered disproportionately more damage during the September 2010 disaster that did older established properties and this fed the pre-existent popular impression that building construction was a major contributing factor (Sah and Pande, 1987). However, one reason for this observation is simply that the older properties had been constructed, selectively, on the more stable sections of the hillside while newer buildings had been forced to adopt sites that were ‘subprime’ with respect to the stability of their local environment. 22On the Almora Lower Mall, new construction is very commonly associated with landslide activity and affects about a fifth, 21/108, of all instances. Here, T-testing compares those 21 sites where landslides are linked to new building with those 87 where they are not. Landslide sites associated with building construction have significantly weaker rocks (p=0.004), more gentle slide plane angles (44 vs 53 degrees ; p=0.003) and are more associated with slumping processes (p=0.038). They also emerge from hill slopes with fewer trees (15 vs 30 %, p=0.019) and less ground vegetation (53 vs 79 % cover ; p=0.011), which was likely a side-effect of the house construction. This confirms the suggestion that these new structures were constructed on more vulnerable sites. 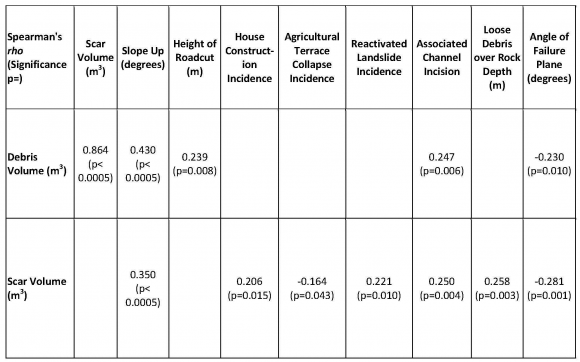 However, ambiguously, landslide outfalls at sites associated with new construction were smaller than those where there was no new construction (162 vs 208 m3) even though they emerged from larger scars (146 vs 116 m3), and while these differences are far from statistically significant, they suggest some kind of healing process. In sum, it is impossible to argue that new building construction was a major factor in the enhancement of 2010 landslide activity. 23Another theme in the discussion about landslides on the Almora ridge concerns the combined effects of suburbanisation and the other economic opportunities provided by road access on the subsistence agriculture economy of the small terraced fields traditional to this region. Terraces are high maintenance structures that require annual repair of their high terrace risers to survive. On steep slopes, the fields they protect can be very small and produce relatively little economic benefit to the farmer when compared to other opportunities in an expanding urban area. Of course, when such terraced land is abandoned, sold for future development, or even when its economic significance to the farming family is reduced, repair may be neglected and the terraces fail. Elsewhere, in their 3 year study of the Likhu Khola, Nepal, Gerrard and Gardner (2002) found terrace collapse to be the major source of landslide activity. The problem is also common along the Lower Mall road, where almost a third of all landslides (33/108) involve the collapse of terraces. However, once again, T-testing shows that the resulting landslides emerge from significantly smaller scars (60 vs 148 m3 ; p=0.028) and generate less debris than other slides, although the difference is not significant (86 vs 247 m3 ; p=0.117). They are also heavily associated with the reactivation of old slumps (p=0.024) on slopes that were less steep (9.6 vs 33.3 degrees, p=0.0005) and colder (p=0.016), which had less forest (8 vs 30 % cover, p=0.008), no house construction, (p<0.0005) but more loose debris (3.8 vs 1.5 m, p=0.024) and lower roadcuts (4.6 vs 6.4 m ; p=0.021). In sum, agricultural terrace collapse was associated with landslide activity – but only with smaller landslide events affecting the old landslide debris deposits where most terraced fields are sited. 24So, the question arises, if not these human factors, what were the main environmental controls of the largest landslides on the Almora road ? Here, stepwise discriminant analysis is used to classify the landslide data set into three categories – the largest and smallest thirds and the others. The procedure required just four variables to produce a function that reassigned 61 /108 cases to their correct categories and that contained only 3/67 cases where one of the smallest landslides was classed with largest or vice versa. The four variables employed were : slope angle upslope, landslide type, height of the roadcut and the incidence of channel incision. 25For many years, debate centred on whether or not geological and tectonic factors were the main control of landslides in the Lesser Himalaya (Sati et al., 1998) or whether anthropogenic, human development, factors were stronger, especially when working in conjunction (Pande et al., 2002). Pande et al., (2002) argue that rock strength, dip, structural weaknesses such as bedding and joints low vegetation cover, thin soils and human activities were, together, the main causes of landslides. Dahal et al., (2008) prefer that human and geomorphological factors are more important than geological. However, this study has shown that neither geological, nor anthropogenic, nor indeed most geomorphological factors (other than slope steepness and local channel incision) were significant correlates of landslide activity on the Almora Lower Mall during the disaster of September 2010. Indeed, deforested sites, sites associated with terrace collapse and, arguably, new building work all generated smaller than average landslide outfalls, although these differences were not generally statistically significant. 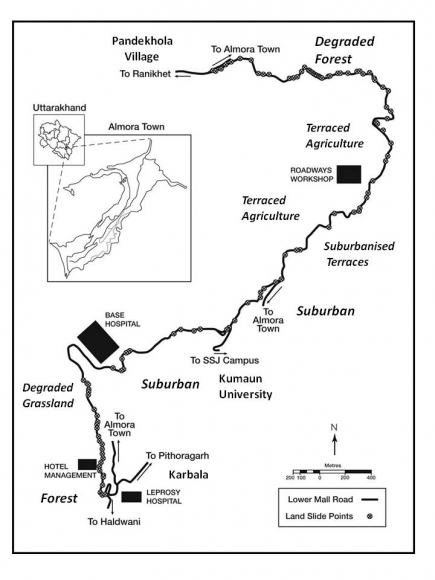 26In the West Indes, Maharaj (1993) identified road engineering as a significant accelerator of landslide activity. 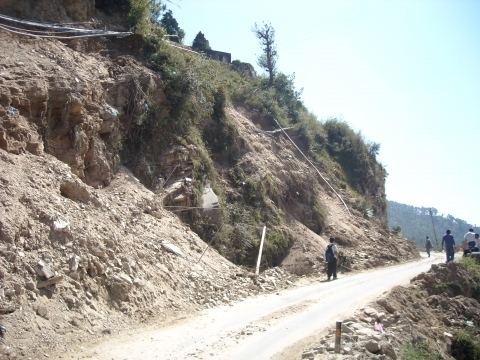 In Almora also, several factors associated with road construction were significantly associated with landslide volume. However, only roadcut height exhibited a relationship that was both positive and significant. The presence of collapsed retaining walls or another road upslope were associated with smaller than average landslides. 27Of course, the authors were among the first wave of those to recognise the role of random processes in landslide generation on steep hill slopes that are close to their critical limits for slope stability (Haigh, 1984, 1988b ; Haigh et al., 1992 ; Bak, 1996, pp77-78 ; Brunetti et al., 2009). So, it may be accepted that these landslides have such sensitive dependence on their initial conditions that landslides may be sparked unpredictably, apparently at random, by any stimulus, which, in this case, was severe rain falling on waterlogged land that was already close to failure (Jaiswal, 2011). The situation is not unique to landslides, there are many examples of catastrophic events that display such a very sensitive dependence on initial conditions that they are individually unpredictable (Buchanan, 2000 ; Haigh, 2002). However, as Jaiswal (2011) indicates, this element of unpredictability is moderated by other factors, here principally, slope angle upslope and the height of the initial roadcut, which affect the criticality of the hillslope. In fact, if the Almora Case were studied alone, this might be the most appropriate final conclusion for this study. 28However, there is a further complication, which emerges when the landslide activity on the Almora Lower Mall is explored through time and in comparison with the results from its twinned project on the Kilbury Road near Nainital. Figure 7 graphs landslide numbers on both roads for all of the occasions when individual landslides were recorded in the period 1985-2010. This tells a simple story. In 1985, there were more landslides on the Kilbury Road than on the Almora Lower Mall Bypass but, in 2010, there were very few. Meanwhile, the number of active landslides on the Almora Lower Mall has remained fairly steady. 29Of course, it is unfortunate that the Kilbury Road Surveys were not completed for those intervening years but the fact that this record exists at all is very unusual. Clearly, a great deal remains to be done to explore the whole time series. Meanwhile, field notes from Kilbury 1990 show that, while this team completed their reconnaissance survey, based on 200m road survey units (Figure 1) ; they had to abandon their survey of each individual landslide for lack of time. The 1990 field log book contains the records of 25 landslides, which were recorded over a 1.5 km reach. This suggests a total of approximately 100 -130 for the whole of the Kilbury 7.4 km road section. Certainly, field notes suggest that the number of landslides that awaited recording was still, at that time, very large. Subsequently, as local testimony agrees, the impacts of road construction have largely healed in the undisturbed forest of the Kilbury Road. However, landslide problems persist on the Almora Lower Mall and, whatever may have happened in 2010, and howsoever this may have affected the volumes of debris produced, the most obvious possible explanation for the constancy in the number of active landslide systems through the intervening years is continued human disturbance associated with suburban development along the road way. 30In sum, this study generates as many questions as answers, which is not an unusual outcome of field research. 31In the aftermath of every major disaster, communities launch a search for explanations and, since Geography is a public science, Geographers are commonly called upon to provide the answers requested. Frequently, modern GIS technologies make the description of a disaster’s consequences relatively easy. However, determining causes can be much more difficult, especially when the local community believes that it knows, already, what are those causes and their implications. 32The Almora Landslide swarm disaster of September 18-19th, 2010, affected lives, livelihoods and infrastructure. It caused around $ 125 million of damage, in the new Indian State of Uttarakhand (District Administration, Almora, 2011). In Almora town, popular opinion argued that the disaster had been made worse by recent urban development and other human impacts, while local scientific opinion blamed weaknesses in the geological environment coupled with the effects of the rainstorm itself. If either view were accepted, appropriate planning, development and insurance policy decisions might be expected to follow. 33However, scientific study of the landslides generated by the September storm on the Almora Lower Mall, the town’s bypass, tells a different story. Here, records show that the number of landslides recorded was not unusual, although debris production was certainly enhanced by this extreme event, especially for those landslide types associated with flow. However, apart from steepness of the hillslope and the height of the initial roadcut, few environmental variables correlated with enhanced landslide debris production. Indeed, statistical analysis indicates that the traditional suspects – deforestation, building construction, the collapse of agricultural terraces, the collapse of roadcut retaining walls, and the presence of other roads upslope of the landslides all tended to be associated with smaller than average outfalls. Among the human induced variables, only the height of the original roadcut was associated with larger landslide outfalls, while geological factors seemed to play minor roles. The conclusion from this case study was that neither human development nor local environmental factors played a significant role in the enhanced debris production of September 2010, apart from the initial slope angle and, in the case of this highway, the undermining of the hillside by the original roadcut and/or by local channel incision. Instead, the these landslides were produced by hillsides that are close to their critical limits of stability and where individual sites have such a sensitive dependence on initial conditions that landslide emergence is predictable only in statistical terms, even if this emergence is fostered by some key influences, notably the steepness of the hillslope, height of the initial roadcut and local channel incision (Haigh, 2002). 34The only question mark against this conclusion, which is validated by the statistical analysis of the 2010 data set, appears when the long term performance of the landslides on this suburban highway is compared with that of another road, the Kilbury Road, Nainital, which was originally part of a paired study of landslides along new hill roads (Haigh et al., 1988a). During the first survey, conducted in 1985, a similar 7.4 km reach of the Kilbury Road received 153 landslides to the Almora Lower Mall’s 88. However, in 2010, the Kilbury Road, which runs through undisturbed reserved forest, received only 9 landslides to the rapidly urbanising Almora Bypass received 108. The fact that the Kilbury Road did not experience the full force of storm of September 18-19th, 2010, is not sufficient to account for the differences. The records also show that the numbers of landslides on the Almora Lower Mall was not exceptional – only their volume was unusually large. So, the final conclusion is that, while human disturbance is not immediately responsible for the degree of landslide debris production during the storm of September 2010, it is the only possible explanation for why these landslides have not healed as on the forested Kilbury Road. In sum, the processes that determine the numbers of landslides along these roads are not the same as those that affect the volume of debris produced by those landslides, which is influenced by slope steepness, the height of the initial roadcut and active undermining, and the inherent critical instability of the hillsides, which leaves them highly sensitive to disturbance. Prof J.S. Rawat sends thanks to the NRDMS Division, Department of Science and Technology, Government of India, New Delhi for the financial support needed to carry out this field survey and laboratory analysis. BARTARYA S. K. and VALDIYA K. S. (1989), “Landslides and Erosion in the Catchment of the Gaula River, Kumaun Lesser Himalaya, India”, Mountain Research and Development, 9, 4, pp. 405-419. http ://www.jstor.org/stable/3673588 , last retrieved 01.10.2011. BUCHANAN M. (2000), Ubiquity : the science of history, London, Weidenfield Nicholson. BRUNETTI M.T., GUZZETTI F., ROSSI M. (2009), “Probability distributions of landslide volumes”, Nonlinear Processes in Geophysics, 16, pp 179–188. CROZIER M.J. (2005), “Multiple-occurrence regional landslide events in New Zealand : hazard management issues”, Landslides, 2, 4, pp 247–256. CROZIER M.J. (1973), “Techniques for the morphometric analysis of landslides”, Zeitschrift fur Geomorphologie, N.F. 17, pp. 78-101. DAHAL R.K., HASEGAWA S., NONOMURA A., YAMANAKA M., DHAKAL S., PAUDYAL P. (2008), “Predictive modelling of rainfall-induced landslide hazard in the Lesser Himalaya of Nepal based on weights-of-evidence”, Geomorphology, 102, 3-4, pp. 496-510. DISTRICT ADMINISTRATION, ALMORA (2011), Natural calamity, Almora, Uttarakhand, District Administration. http ://almora.nic.in/pages/display/66-casualty-damage, last retrieved 01.10.2011. FROEHLICH W. and STARKEL L. (1993), “The effects of deforestation on slope and channel evolution in the tectonically active Darjeeling Himalaya”, Earth Surface Processes and Landforms, 18, 3, pp. 285–290. GERRARD J. and GARDNER R. (2002), “Relationships between landsliding and land use in the Likhu Khola Drainage Basin, Middle Hills, Nepal”, Mountain Research and Development, 22, 1, pp. 48-55. GLADE T., (2003), “Landslide occurrence as a response to land use change : a review of evidence from New Zealand”, Catena, 51, pp. 297-314, http ://homepage.univie.ac.at/thomas.glade/Publications/Glade2003a.pdf, last retrieved 05.10.2011. HAIGH M.J. (2002), “Landslide prediction : criticality, magnitude and frequency”, in Subramanian V. (ed. ), Environmental Hazards in South Asia, New Delhi, Capital Publishing, pp. 3-10. HAIGH M.J. (1984), “Landslide prediction and highway maintenance in the Lesser Himalaya, India”, Zeitschrift für Geomorphologie, Suppl. Bd 51, pp. 17-38. HAIGH M.J., RAWAT J.S., BARTARYA S.K. (1988a), “Environmental correlations of landslide frequency along new highways in the Himalaya : preliminary results”, Catena, 15, 6, pp. 539-553. HAIGH M.J., RAWAT J.S., BARTARYA S.K. (1988b), “Entropy minimising landslide systems”, Current Science, 57, 18, pp. 1000-1002. HAIGH M.J., RAWAT J.S., BARTARYA S.K., RAWAT M.S. (1993), “Factors affecting landslide morphology along new highways in the central Himalaya”, Japanese Geomorphological Union, Transactions 14, 2, pp. 99-123. HAIGH M.J., RAWAT J.S., RAWAT M.S., BARTARYA S.K., RAI S.P. 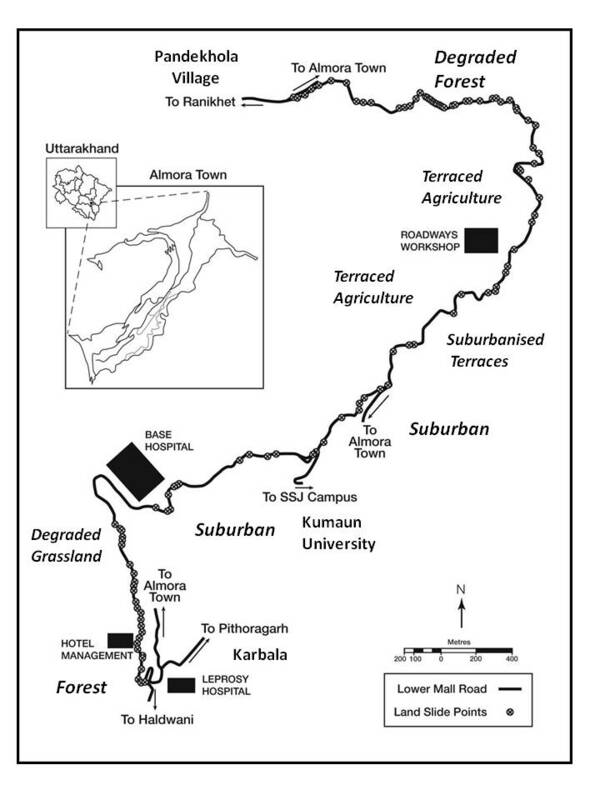 (1995), “Interactions between forest and landslide activity along new highways in the Kumaun Himalaya”, Forest Ecology and Management, 78, 1-3, pp. 173-189. JAISWAL P. (2011), Landslide risk quantification along transportation corridors based on historical information, Enschede, NL, Twente University, ITC Dissertation, 191. http ://www.itc.nl/library/ papers_2011/ phd/jaiswal.pdf, last retrieved 07.02.2011. KAPUR A. (2010), Vulnerable India : a Geographical Study of Disasters. New Delhi, Sage. MAHARAJ R.J. (1993), “Landslide processes and landslide susceptibility analysis from an upland watershed : A case study from St. Andrew, Jamaica, West Indies”, Engineering Geology, 34, 1-2, pp. 53-79. PANDE A., JOSHI R.C., JALAL D.S. (2002), “Selected landslide types in the Central Himalaya : their relation to geological structure and anthropogenic activities”, The Environmentalist, 22, 3, pp. 269-287. PETLEY D.N., HEARN G.J., HART A., ROSSER N.J., DUNNING S.A., OVEN K., MITCHELL W.A. (2007), “Trends in landslide occurrence in Nepal”, Natural Hazards, 43, pp. 23–44. RAUTELAA P. and PAULB S.K. (2001), “August 1998 landslide tragedies of central Himalayas (India) : learning from experience”, International Journal of Environ­mental Studies, 58, 3, pp. 343-355. RAWAT J.S. (2010a), GIS of Almora Disaster 2010, Almora, Kumaun University Centre for Natural Resources Data Management System. RAWAT J.S. (2010b), “Database management system for Khulgad watershed, Kumaun Lesser Himalaya, Uttarakhand, India”, Current Science, 98, pp. 1340-1348. http://www.indiaenvironmentportal.org.in/files/Khulgad %20Watershed.pdf, last retrieved October, 2011). SAARC SECRETARIAT (1992), “Chapter 13 : Mass Wasting and Land Slides”, Regional Study on the Causes and Consequences of Natural Disasters and the Protection and Preservation of the Environment. Kathmandu, South Asian Association for Regional Cooperation, pp. 158-164, http ://www.saarc-sec.org/userfiles/Large %20Publications/CCNDPPE/17-CCNDPPE-Chapter %20XIII %20- %20Mass %20Wasting %20and %20Land %20Slides.pdf, last retrieved 23.09. 2011. SAH N.K. and PANDE R.K. (1987), “Construction activity and environmental degradation in Almora Town in the Central Himalaya”, Mountain Research and Development, 7, 1, pp. 71-75, http://www.jstor.org/stable/3673325, last retrieved 01.10.2011. SATI S. P., SUNDRIYAL Y. P. NARESH R. and SUREKHA D. (2011), “Recent landslides in Uttarakhand : nature’s fury or human folly”, Current Science, 100, 11, pp. 1617-1620. SATI S.P., NAITHANI A. and RAWAT G.S. (1998), “Landslides in the Garhwal Lesser Himalaya, UP, India”, The Environ­mentalist, 18, 3, pp. 149-155. Martin Haigh et Jiwan Singh Rawat, « Landslide causes: Human impacts on a Himalayan landslide swarm », Belgeo, 3-4 | 2011, 201-220.